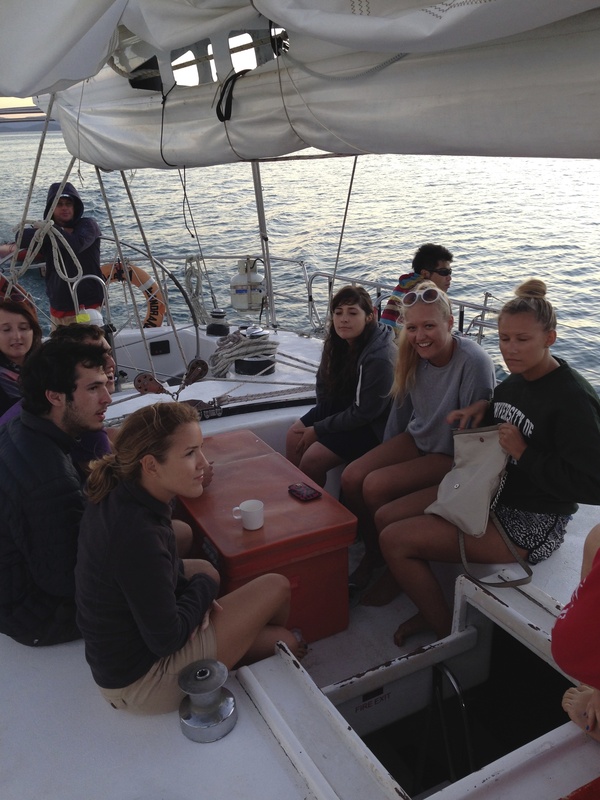 We had booked tickets aboard ‘The Mandrake’ and had to check-in at 8.30 am the following day for a ‘security briefing’. The ‘check-in’ basically consisted of the crew telling us to bring a small bag of clothes, no valuables and no red wine onto the boat… It was a waste of time ‘checking-in’ at 8.30 am because the boat didn’t leave until 2.30pm! We caught up on sleep in the van for a little while before we tested out the public electric BBQs that we’d seen around town for lunch. Later in the afternoon we made our way towards the marina to find the catamaran and the people we’d be spending the next couple of days with. Our catamaran was pretty small and there were only 13 people on our boat, so a lot smaller than the bigger party boats that hold over 100 people for 3 nights. The majority of the passengers were British apart from two French girls, an Israeli, and an American girl who wouldn’t stop going on about Taylor Swift (!!!!). 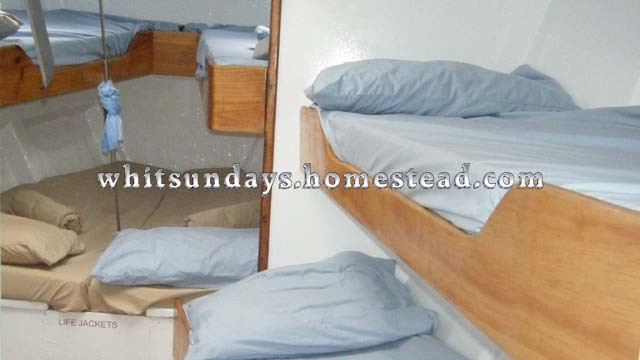 As soon as we got on the boat, we were shown to our bunks and it came apparent that there’d be very little privacy over the next couple of days… The toilet was so small that you could barely move. Our sleeping quarters were right in the bow of the catamaran and they’d somehow managed to fit 6 bunks in the tiny room. We were putting our belongings onto our bunks when two French girls asked me whether this was all a joke? They were apparently expecting a luxurious catamaran with a beautiful ensuite cabin and an endless supply of champagne… all for $400. They were living in a dream world! Stole this picture to show you exactly how small it was… We were in the two bunks next to each other at the bottom. It was so cramped downstairs that we all went to sit on the deck to enjoy the sunset before the anchor went down for the night. It was a really nice evening on the boat and we were served a lovely spaghetti bolognese prepared by Tom, the Mandrake’s deck hand and host (he was also a splitting image of Olympic Swimmer Tom Daley). After dinner we tried for the first time ‘goon’ (what Aussies call box wine) and got to know the other people on the boat. 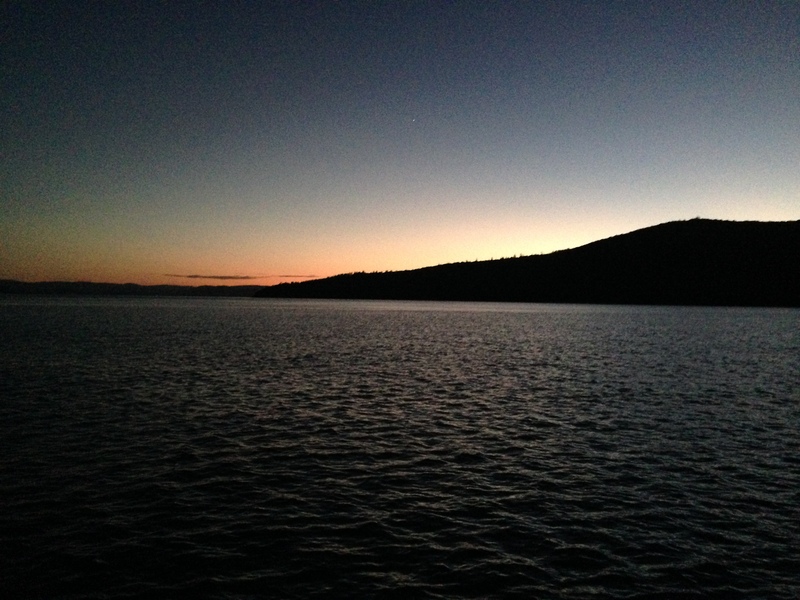 I actually slept amazingly well on the first night – perhaps it was the slight rocking of the boat or too much goon? As our bunks were right in the bow of the ship, we were woken up at 5.30am by the captain rising the anchor. We managed to fall back asleep for a little while longer before we were woken up again for breakfast by Tom at 6.30am. The two French girls were rather unimpressed with the breakfast options: cereal, toast, tea and coffee. Maybe they thought Tom was going to rustle up some fresh croissants and a round of espressos for breakfast? They were absolutely miserable and made a point of showing it. 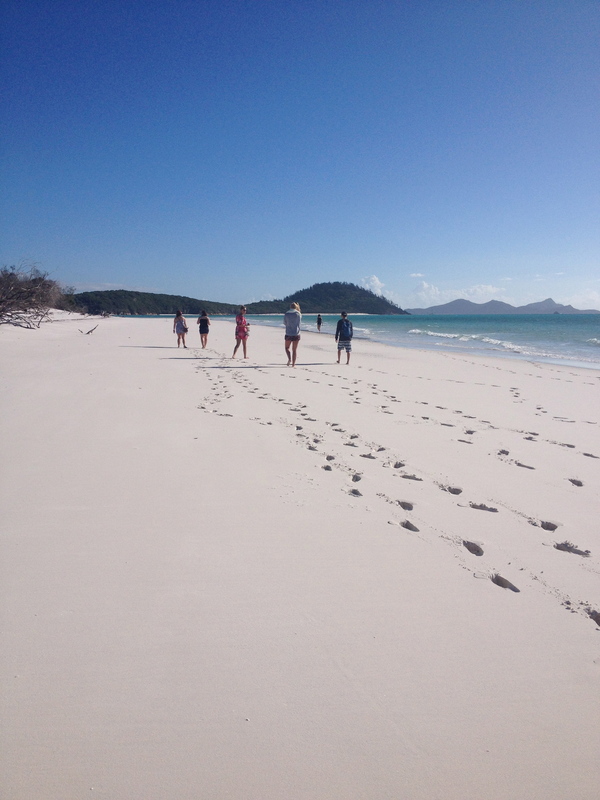 After breakfast and filling up on coffee, the catamaran set sail towards the beautiful Whitehaven beach. 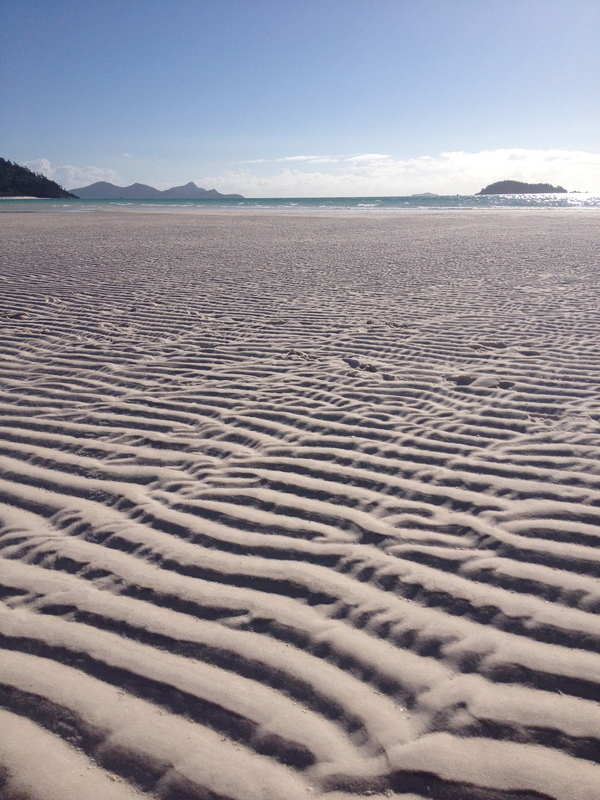 The sand was almost white and had a flour like consistency, and it was completely untouched – there were no other footprints on the beach! 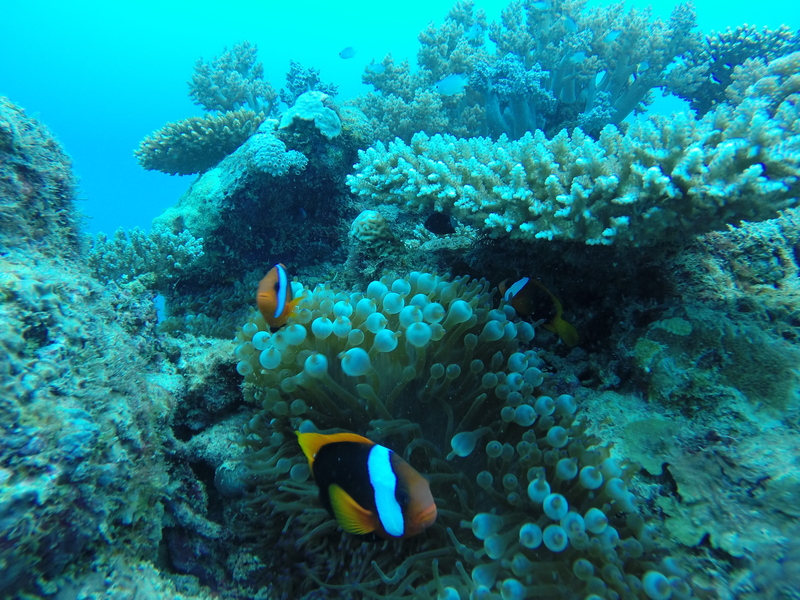 We spent a couple of hours exploring before we returned to The Mandrake for a spot of snorkelling. 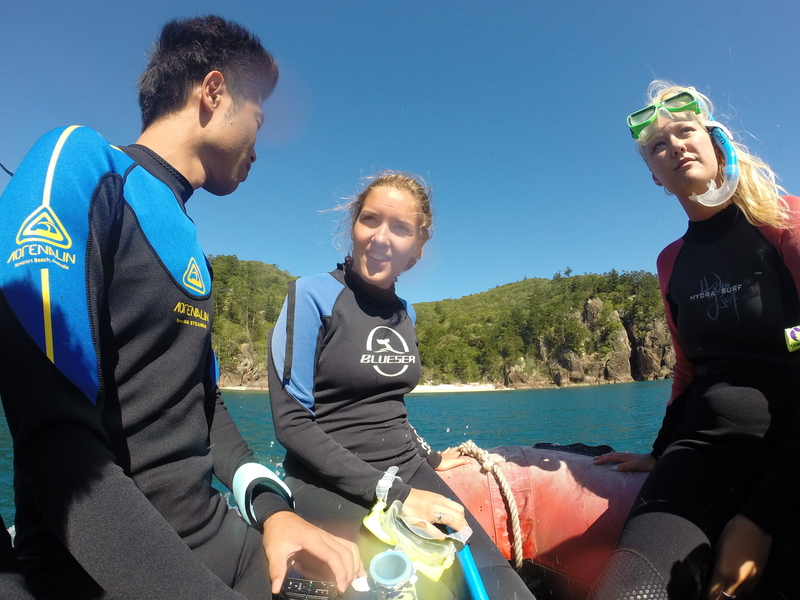 The water was ice cold and the stinger suits that we’d been forced to wear (to protect ourselves against box jellyfish) weren’t thick enough. 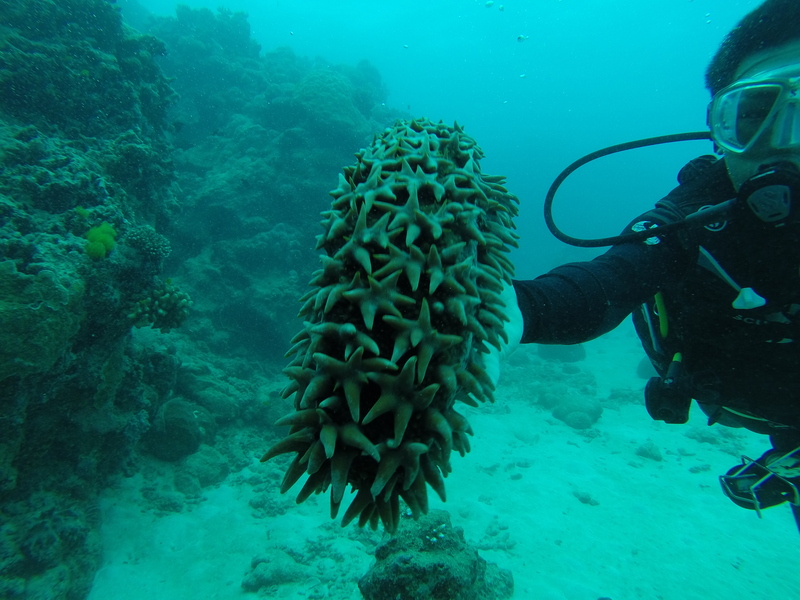 I only managed about 20-30 minutes in the water before I had to go back to the Mandrake, the water was just too damn cold! We spent the rest of the day sailing around the Whitsunday Islands spotting whales and chatting to our new friends on the deck. For dinner we were served hot dogs and mashed potatoes, and it was probably the best mash I’d had for a very long time. The deck hand couldn’t work out whether the sausages were beef, pork or both, so the young Israeli guy had no choice to eat them because there was no vegetarian option available. 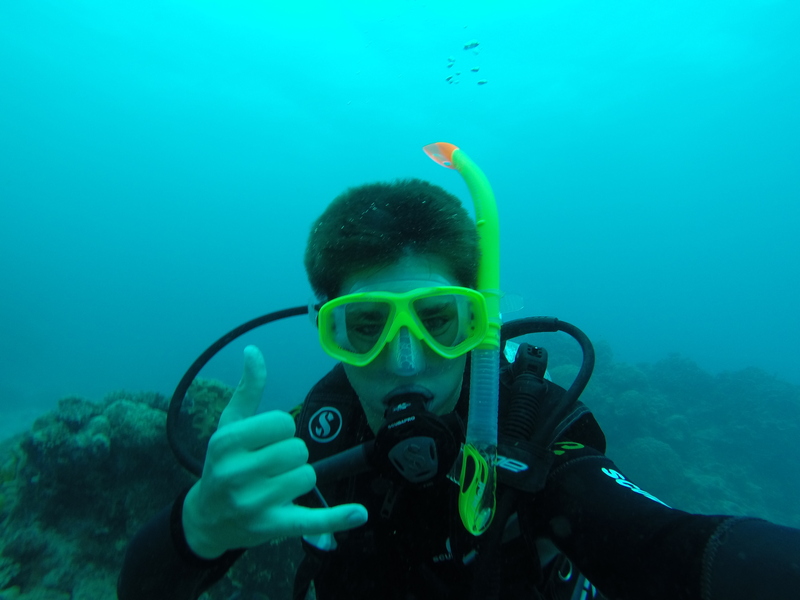 Dan, the young Israeli, had just completed his compulsory three years of military service in Israeli and had hopped on a plane as soon as he finished for a holiday. 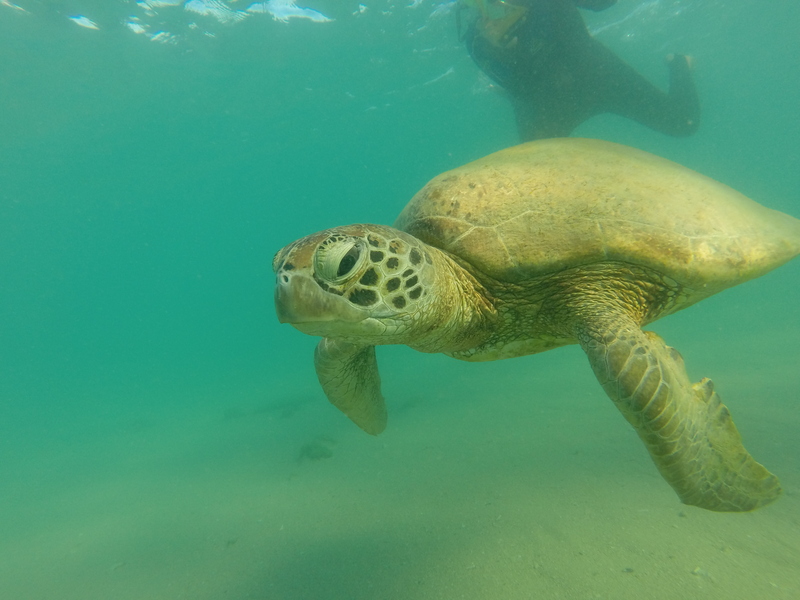 On our last day on The Mandrake we were given the option of hiking to a view point or swimming with turtles… naturally everyone wanted the latter. 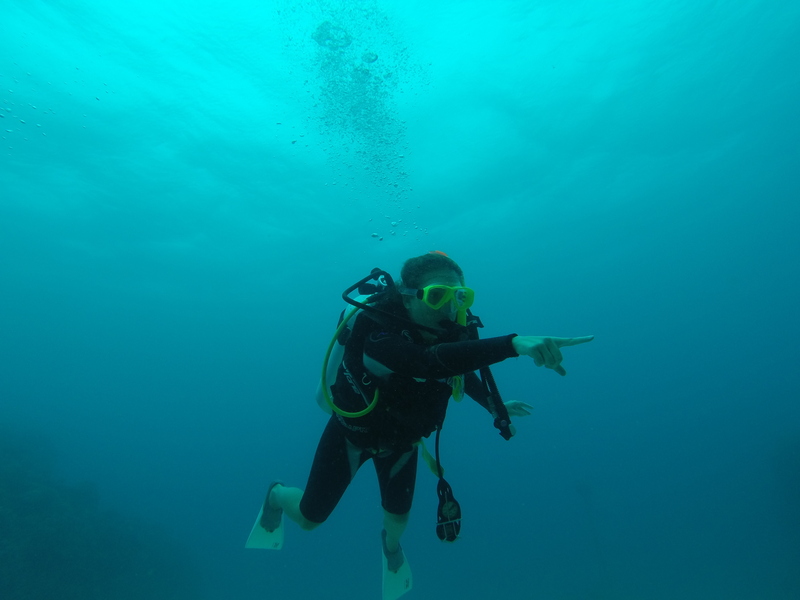 At 7am we’d already eaten breakfast and were getting ready to jump back into the icy water…. there was no need for a coffee pick me up that morning! 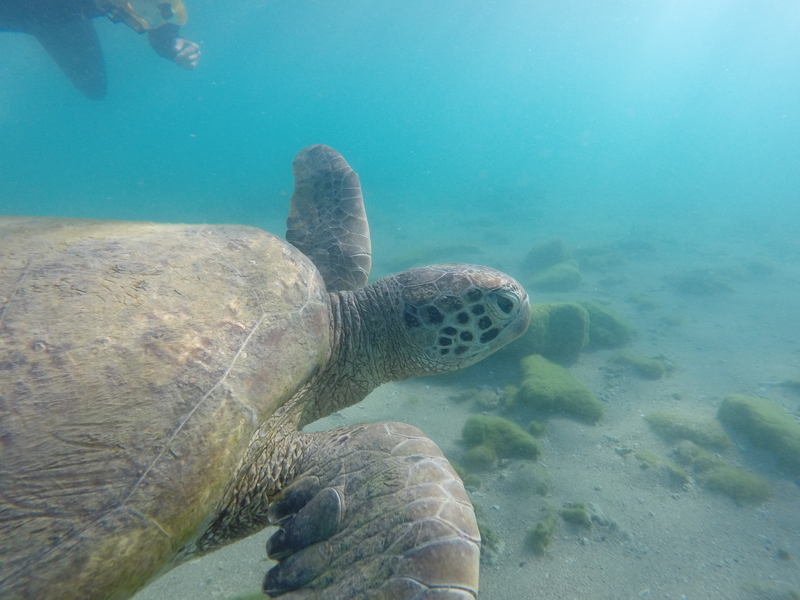 We found loads of turtles so everyone was pretty happy! 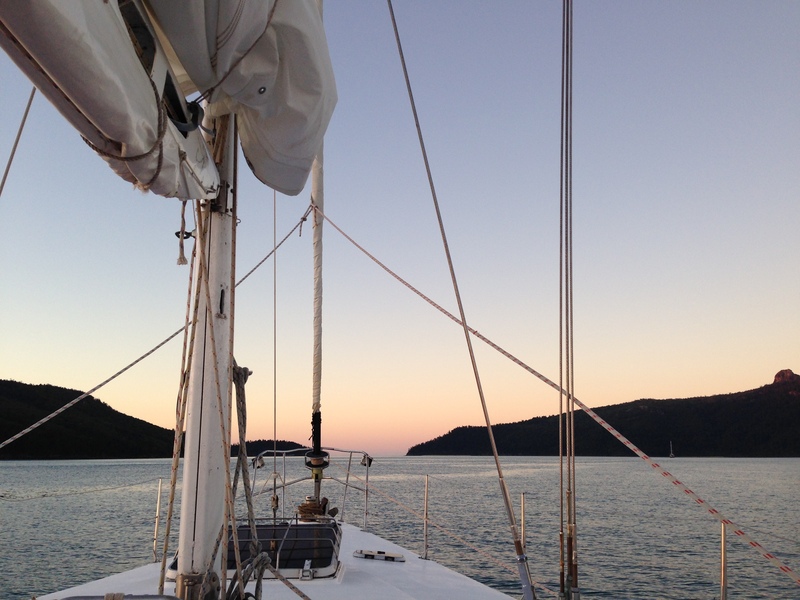 When we returned to the boat, it was time to start heading back towards Airlie Beach but the winds were strong. The winds were so strong that the boat stayed tipped on one side for most of the trip back to Airlie Beach and water poured into the decks below. The sea water soaked the two French girls’ stuff: clothes, shoes, makeup, even an iPad. I kind of felt bad for them because they’d obviously been told it was a luxurious sailing holiday and instead it was a budget and cramped catamaran. I kind of felt that they were pretty stupid for not trying trying to make the most of the situation, but instead they were miserable, complained about everything and refused to socialise with the rest of the group. To top it off… as the French girl was getting off the boat she dropped her designer sunglasses into the sea and lost them forever! 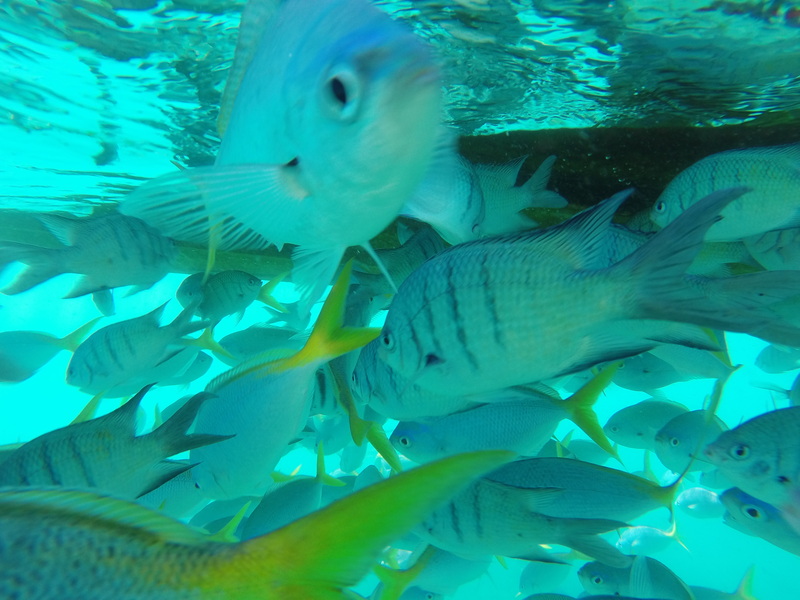 So many fish… I hated them flapping against me. 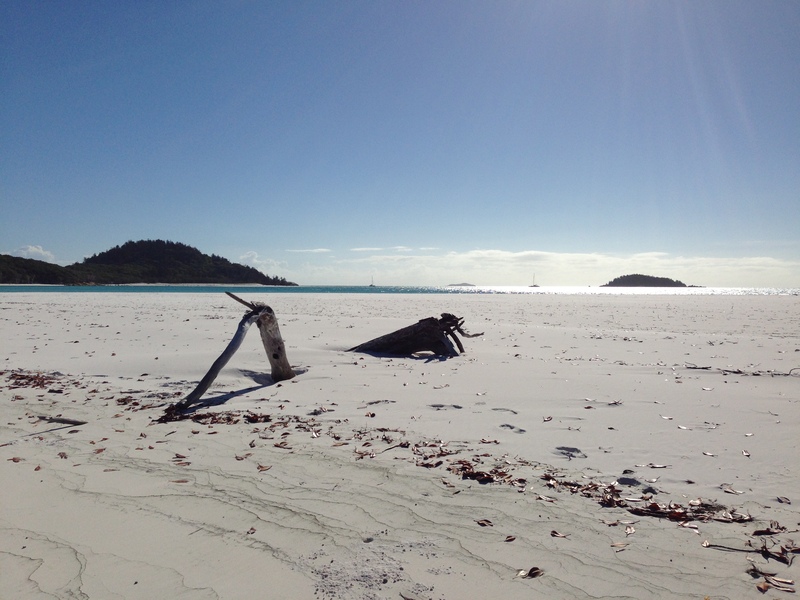 After Magnetic Island we had 2 days or so to drive 300km to Airlie Beach for our Whitsundays Sailing trip. 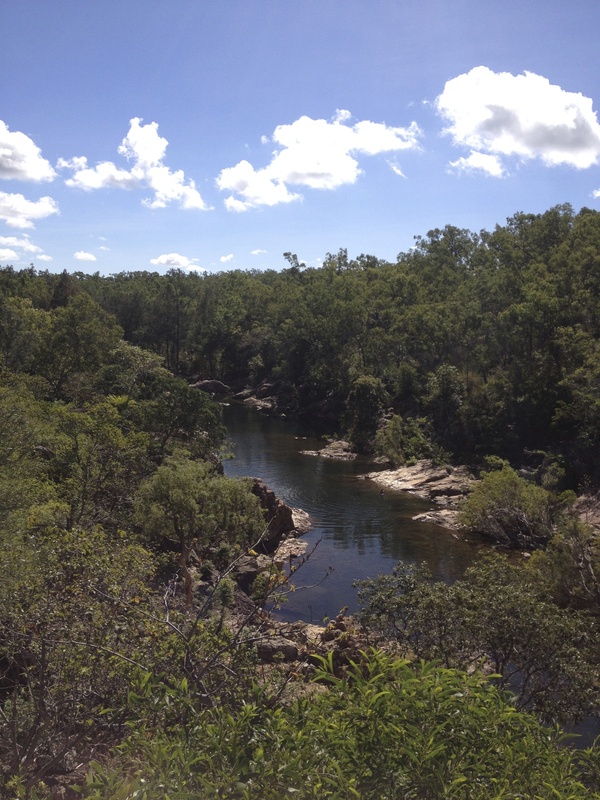 We’d originally planned to camp at either Ayr or Bowen for the night, but we passed a national park on the way with an interesting name ‘Alligator Creek’ so we decided to stop for the night. You had to call up and pay for a camping permit over the phone and Kyle wanted to try and get away with not paying, but I decided to be honest and call up and get the camping permit… I didn’t want an awkward situation where we’re chased off the national park because we didn’t pay. When we finally got the camping permit sorted, it was already dark and we had to cook our chicken tikka masala in the dark. As we didn’t have a fridge in our van, we bought (dare I admit it) a can of chicken to add to the Patak’s sauce. I was a little skeptical at first of trying the canned chicken because I couldn’t get the picture or smell of canned tuna out of my head. Nonetheless we cracked open the can and each tried a small mouthful… it was surprisingly alright! By the time we’d eaten dinner, the camping area was pitch black so we made up the bed in the van and got ready to watch something on Kyle’s laptop. We were watching an episode of Modern Family when suddenly out of the middle of nowhere there was a load thud on the roof of the car followed by some scurrying! There was something on the top of the car running around! It was then that I realised that I’d left one of the windows open and hurried to close it before whatever it was got inside the car. After a while the noise stopped and we got out to inspect what had been attacking our car and found a little possum! Waking up in the van! The following morning we made some makeshift toast in our ‘kitchen’ and then went to explore the Alligator Creek. Disappointingly there were no alligators (obviously), alligators are American, DUH?! 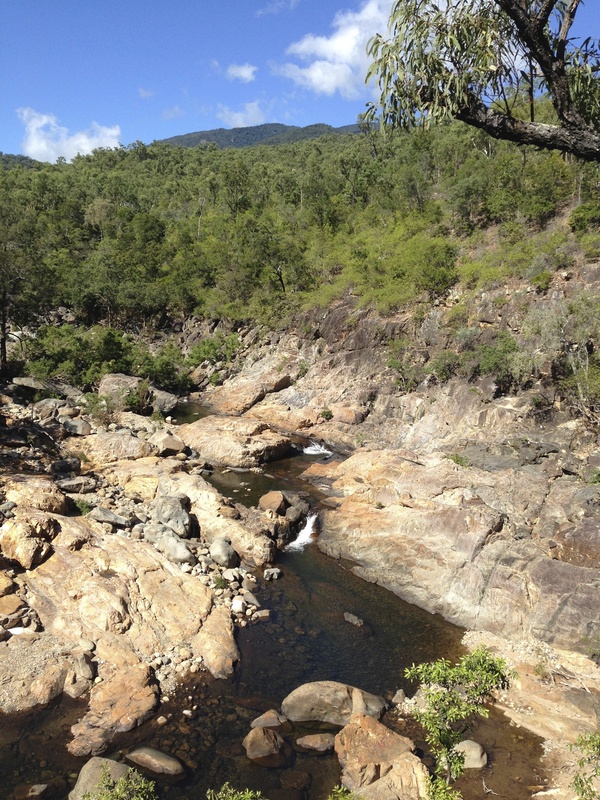 Alligator Creek had some beautiful walks and waterfalls, so we spent the morning here exploring before we hit the road again for Airlie Beach for the Whitsundays. 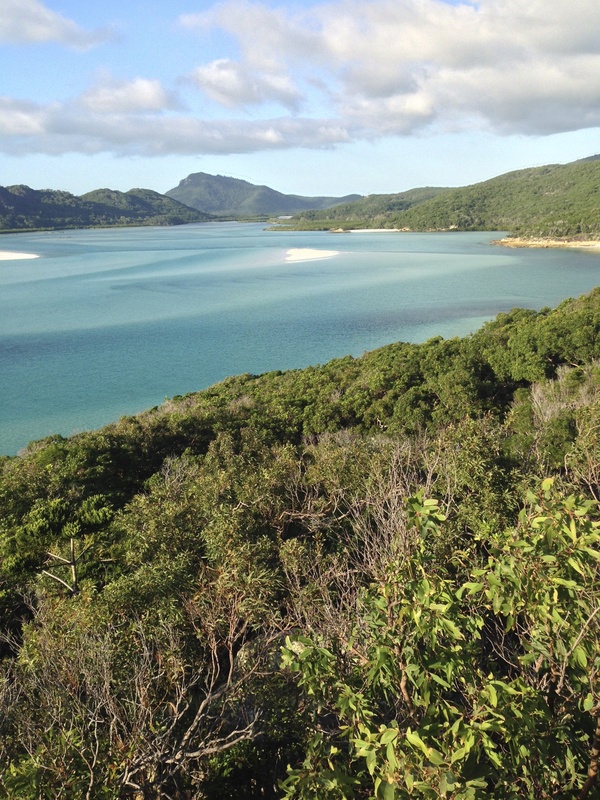 We got to Airlie Beach in the late afternoon and we decided to actually spend the night at a campsite with toilets and hot showers than in a free roadside camp. It was a really nice campsite and had a huge kitchen with utensils, fridges and BBQs to use. We met a nice English couple who were about the same age as us but had come to Australia primarily to work rather than travel. The boyfriend worked on a farm back in England but said it was really difficult to find work back in England and actually make a career for himself. He said that there were a lot more farming opportunities in Australia and that he was earning three times what he was earning in England. Showing Kyle how to use a washing machine! We hit the road early the next day because we had quite a few kms to go until we reached Townsville for Magnetic Island. Joanne’s boyfriend lived in Townsville and we parked our camper at his house and then walked to the ferry terminal to get the boat over to Magnetic Island. We had originally wanted to our van over to the island but it was over $100 for the ferry ticket alone plus a camping permit etc, so we just decided to go on foot. One of my mum’s friends had told me about Magnetic Island before I left for this trip and she had told me it was one of her favourite places in Australia and a must see. I can totally understand why she called it paradise as it had some stunningly beautiful beaches and hikes. 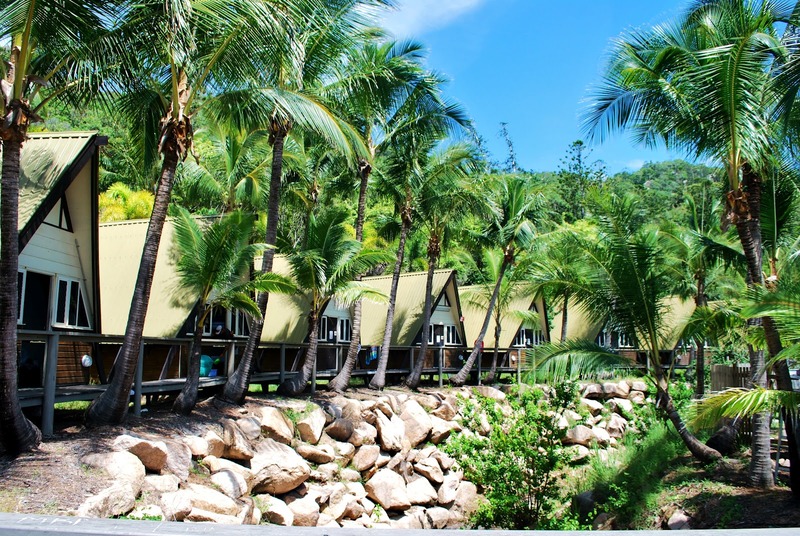 We’d booked a couple of nights at the Base Hostel on Magnetic Island. The hostel was HUGE and was essentially just made of loads of beach huts along the beach that they’d stuffed with as many bunk beds as they could find. 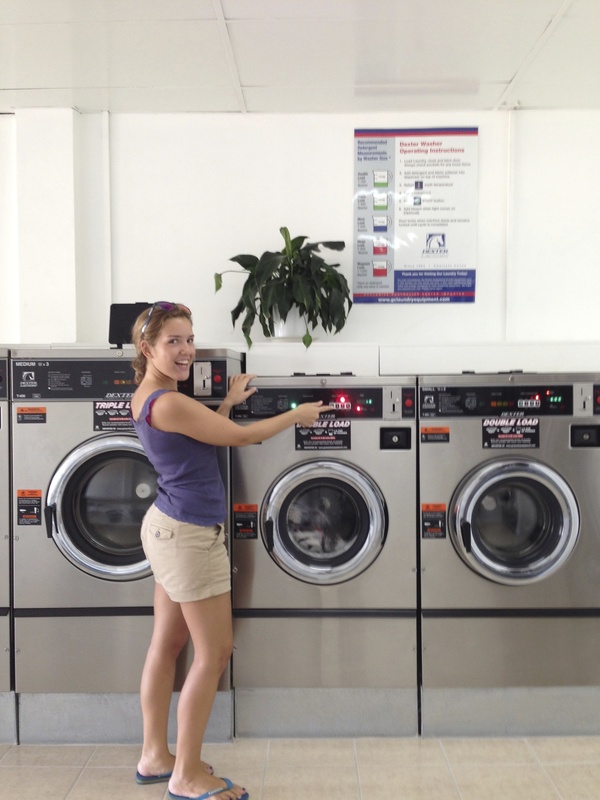 When we walked in our 6-bed dorm, we were greeted with the stench of smelly boys, socks and unwashed clothes. It seemed that some of the people in our dorm had been staying there for a VERY long time. The room was absolutely tiny and barely had enough room for 6 bunk beds let alone everyone’s luggage, and it only had ONE plug socket for the entire room. 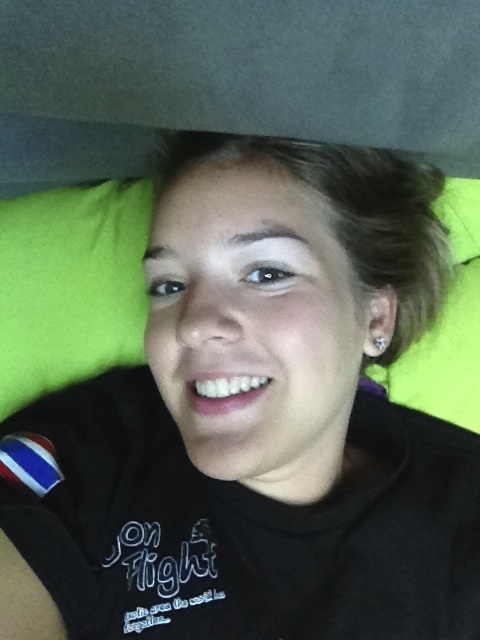 After being in Asia and getting used to having your own lamp and plug for your bunk, the facilities were incredibly basic and the hostel was very overpriced. We got out of the room pretty damp quick and walked to the nearest supermarket and bottle shop. We bought some food to make fish tacos and sat on the beach having a beer whilst the sun went down. The huts at the hostel! The hostel’s kitchen facilities were a bit of a joke. It looked promising when we walked in as there were 16 hobs, but quickly found out only about 5 of them actually worked. The hostel was very poorly maintained and I’d recommend staying elsewhere on Magnetic Island in the future. We met two English guys from our dorm and they’d just come from working on a zucchini farm and were blowing off some steam as they’d just been fired. The guys told us how they’d never worked so hard in their lives and never in such terrible conditions… The farm owner was this awful woman who’d scream abuse at them all day long. One of the boys actually seemed quite traumatised by the way she treated him. 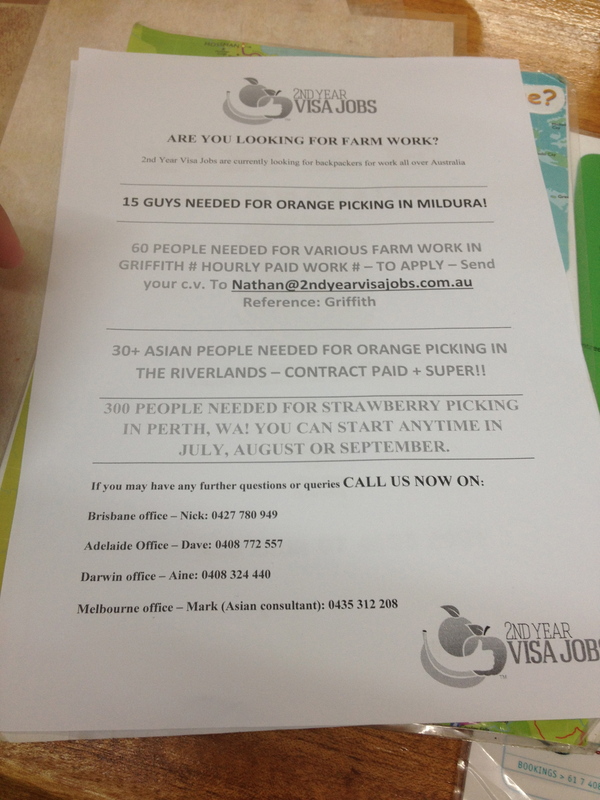 They’d been working on the farm to do the 3 months of required farm work to secure their 2nd year visa when they were fired! To rub salt in the wound the bitchy farm owner only signed them for 18 days of farm work instead of the 80 or so that they’d worked.Naturally they were rather pissed off with the situation and were annoyed that there was no governing body that they could complain to. Apparently from next year the Australian government is going to automatically issue 2 year working holiday visas to stop backpacker exploitation on farms. The boys told us how they were forced to pay $200 in rent a week to live in a 16-bed cockroach infested corrugated iron shed. When they initially applied for the job, the farm owner had told them there was free wifi, TV room, free food, clean showers and kitchen… it was all a lie. One of the boys told us how he had to walk 15 minutes up a hill to get ONE bar of mobile reception, let alone an internet connection. They were completely cut off from the world in the bush. The next morning we woke up early to do some exploring! 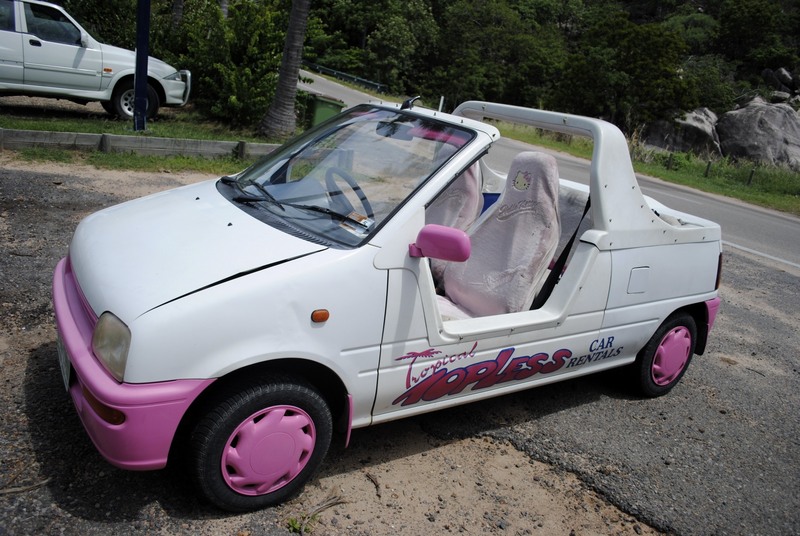 You could hire these Barbie cars for the day to drive around the island but they were incredibly expensive, so we just decided to get the bus and walk on foot instead. We were only wearing flip flops and had to walk down a huge hill on rocky terrain for about 15 minutes to get to this beach that was meant to be a fantastic spot for snorkelling. We put on our silly stinger suits (to protect us against the dangerous box jelly fish) and ran straight into the water to spot some cool stuff. 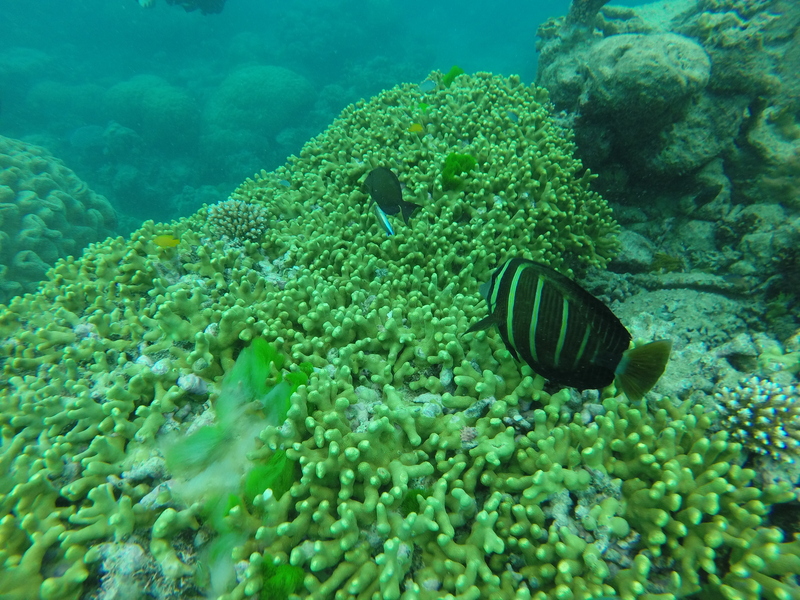 We spent a good half an hour snorkelling but it wasn’t spectacular and we soon realised that we were covered in this funny grey/black oil, so we decided to get out. Magnetic Island wasn’t turning out to be the paradise that I’d imagined. Later that evening we hung out in the hostel’s and the island’s only bar (apparently) and it was full of lots of random drunk old Australian men drinking in the bar all night. They were getting very rowdy and picking fights with people all the time. It seemed that the bar attracted more locals than people actually staying at the hostel. 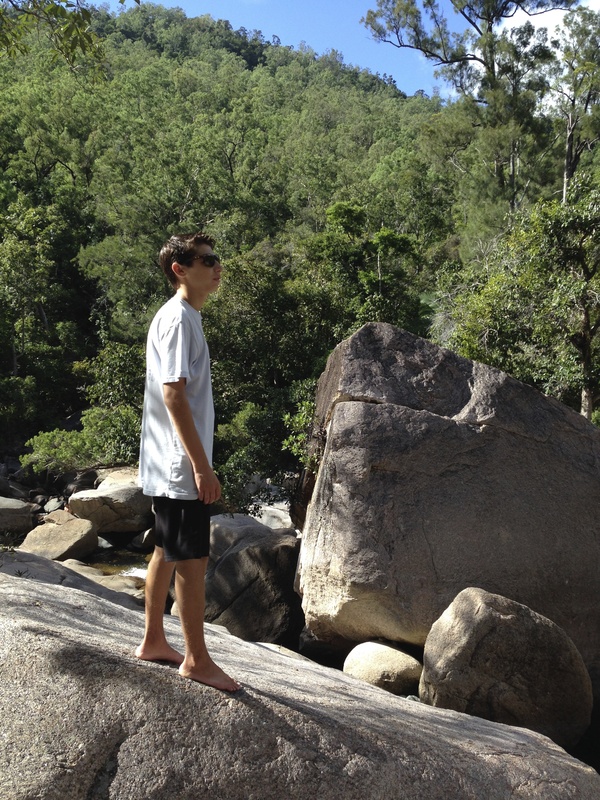 All in all Magnetic Island wasn’t as amazing or as beautiful as I’d imagined. I guess after being in the paradisiac islands of Thailand and Indonesia, it didn’t exactly wow me. It was a cute little island but nothing to write home about! We were excited to get back to the mainland and head on our way. 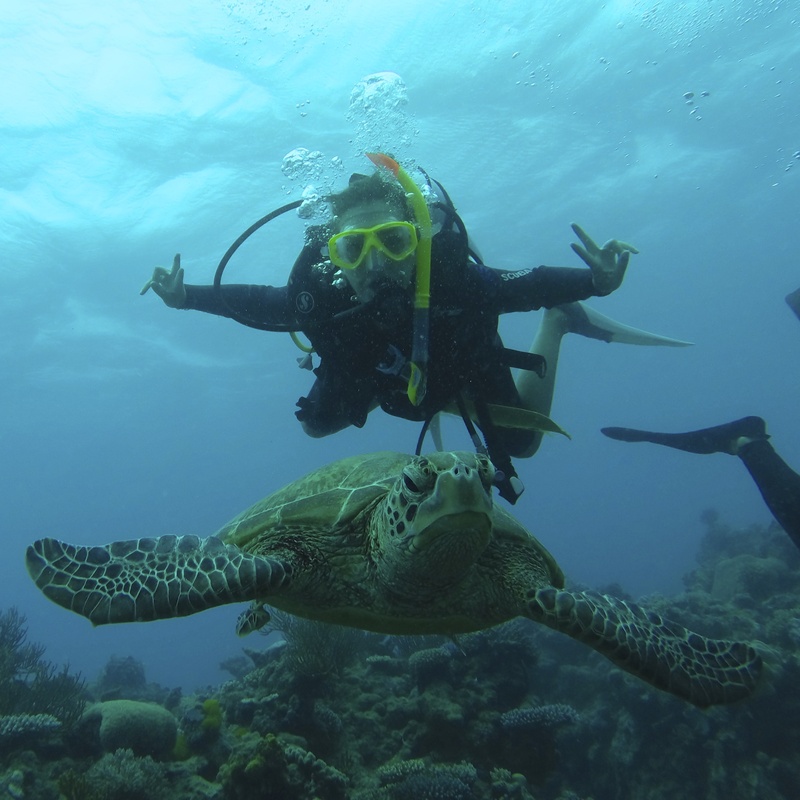 After our amazing dive at the Great Barrier Reef, it was time to get cracking…. book a campervan, look up things that we wanted to see along the way, pack… and leave! 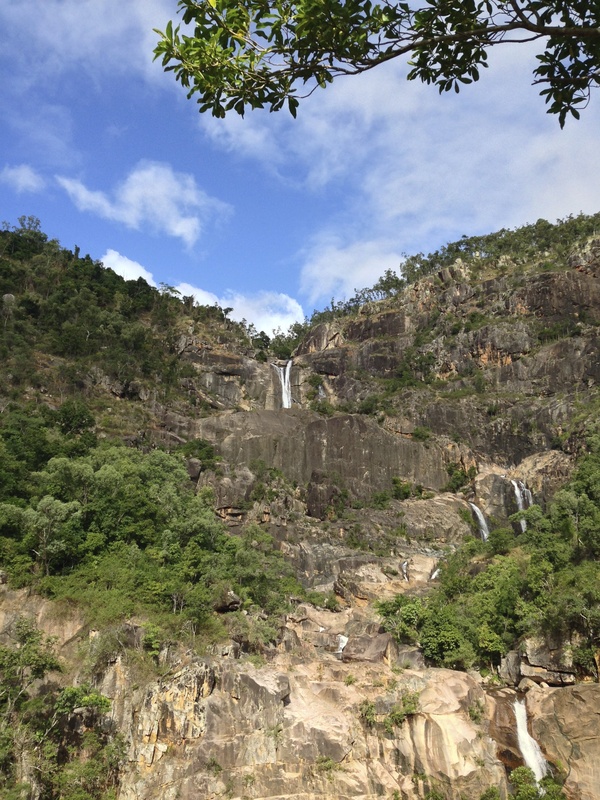 We decided to hire a campervan and drive down the east coast to Brisbane instead of getting the coach, because we would have the freedom to stop at some national parks along the way. We decided to book the campervan with Jucy Rentals (trademark green and purple vans) as we’d seen their campas everywhere and had managed to see what they looked like inside. 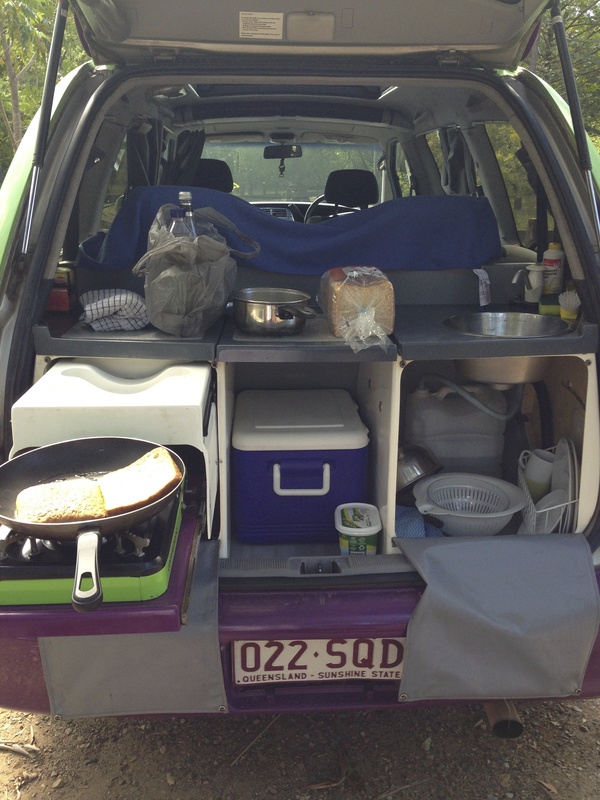 Jucy’s campas were converted Toyota Taragos and were kitted out with a double bed, gas stove, kitchen utensils and sink with water. We arrived at the Jucy Warehouse to pick up our campa and it was the biggest pile of crap we’d seen. The car was really old and battered…dents everywhere and chips in the windscreen. 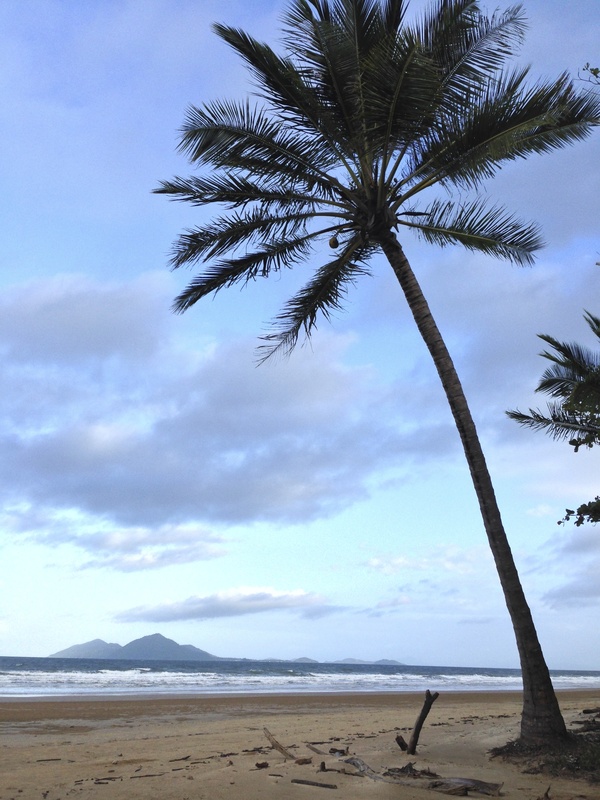 We thought about going north to the Daintree National Park but as we didn’t manage to hit the road until 2pm (5 hours later then planned), we decided just to head south towards Townsville, some 350km away. All packed and ready to go!! 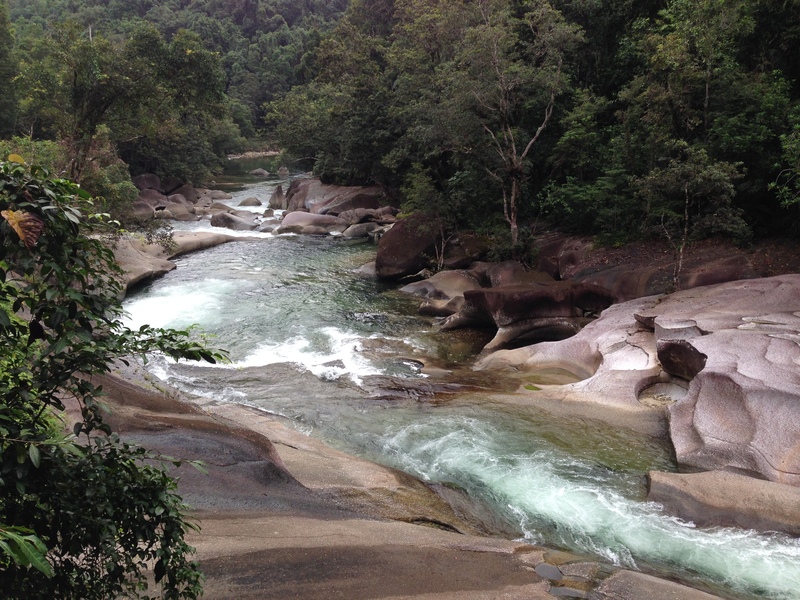 After being on the road for an hour or so, we made our first stop at The Babinda’s Boulders National Park. 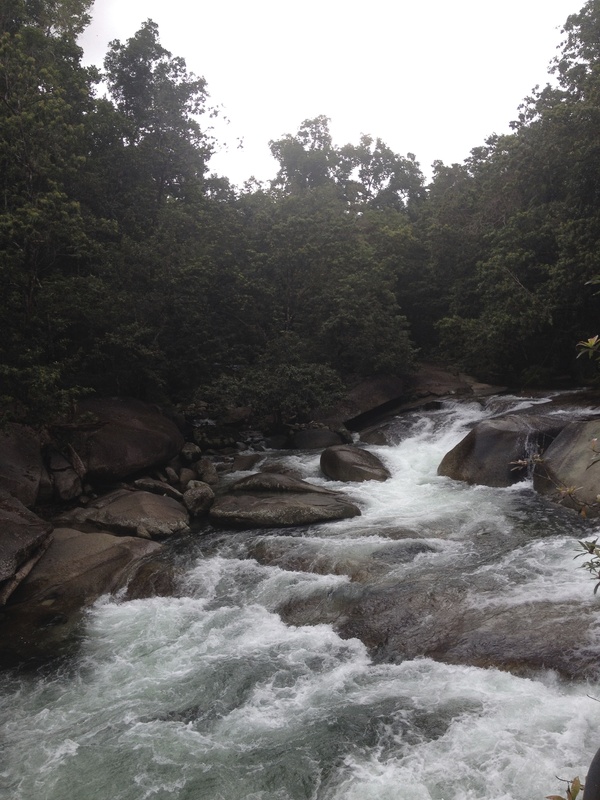 Babinda’s Boulders was full of huge boulders and a beautiful waterfall. 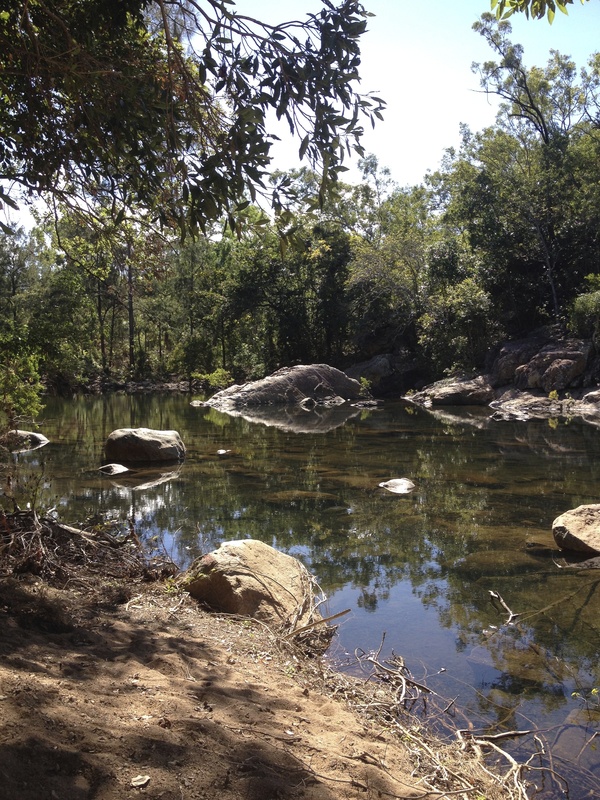 The story behind Babinda’s Boulders goes that a young Aboriginal woman had fallen in love with a young man from another tribe, but her parents had arranged her to marry a man from her tribe. As she didn’t want to marry her parent’s choice, she ran away with her lover and hid in the spot that is the national park until their tribes came looking for them. 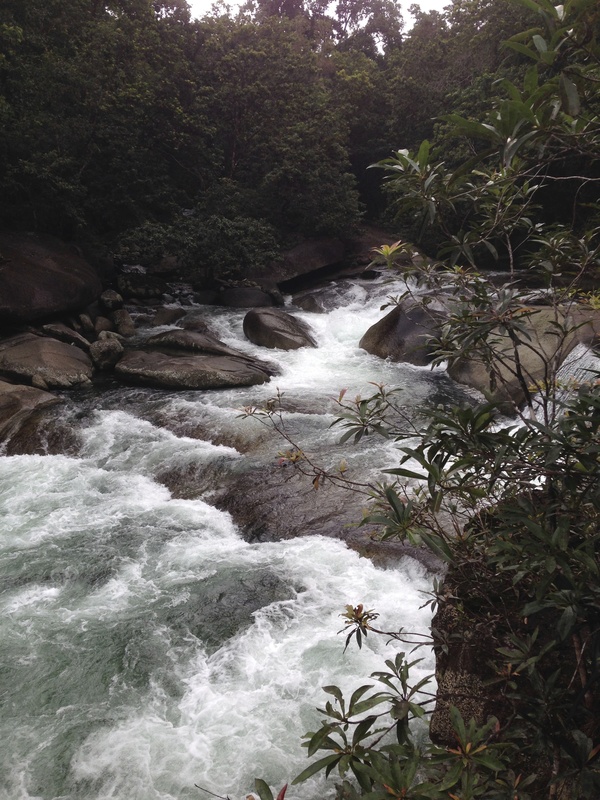 The young lover’s tribe forced him to leave Babinda because he’d already brought a great deal of shame to his tribe. 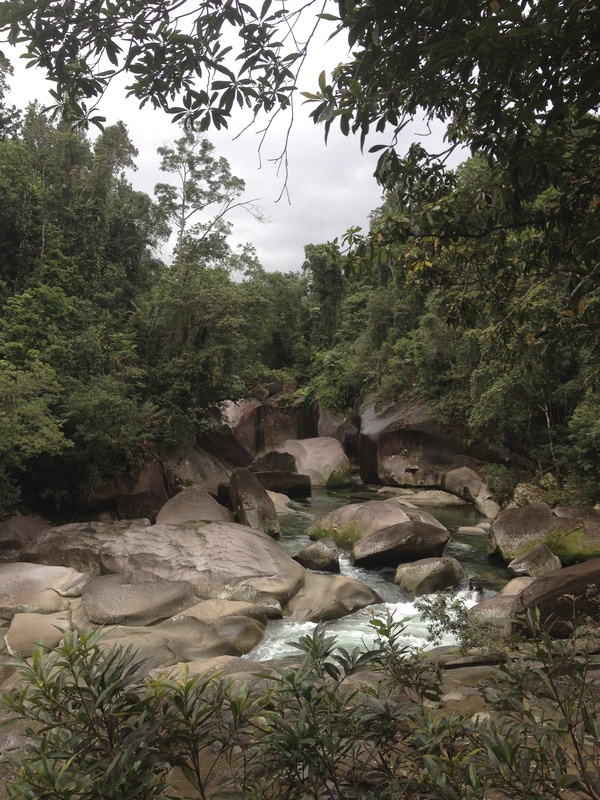 Babinda (the young aboriginal woman) was so furious that she used her powers to make the boulders and waterfall. We spent some time walking around the national park and checking out the view points before it was time to hit the road again. We then made a stop at Mission Beach which seems to be a popular destination for skydiving. 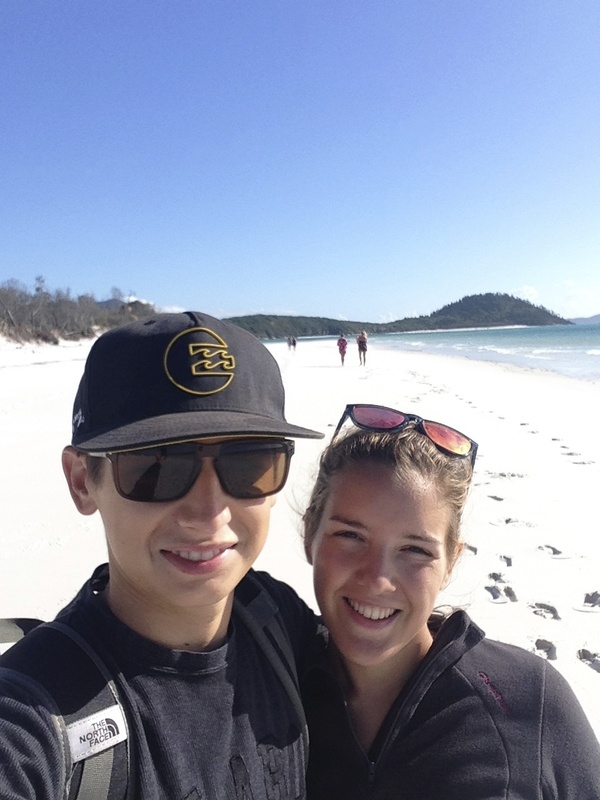 We stopped to have a look at the beach and see what all the fuss was about… it was definitely pretty. I then somehow managed to step on sand which turned out to be a huge puddle of water and was rather annoyed that my trainers were now sopping wet! 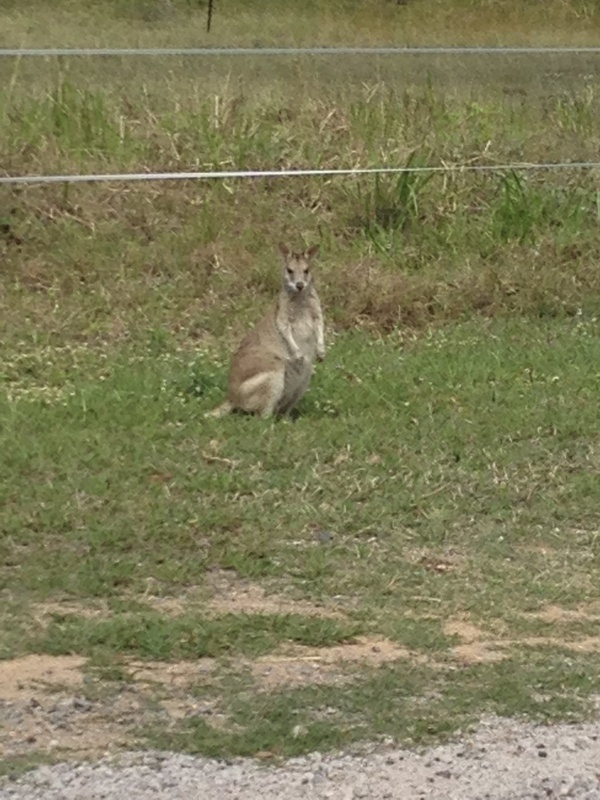 I went back to the car pretty annoyed when we spotted this huge native Australian bird walking around nearby. 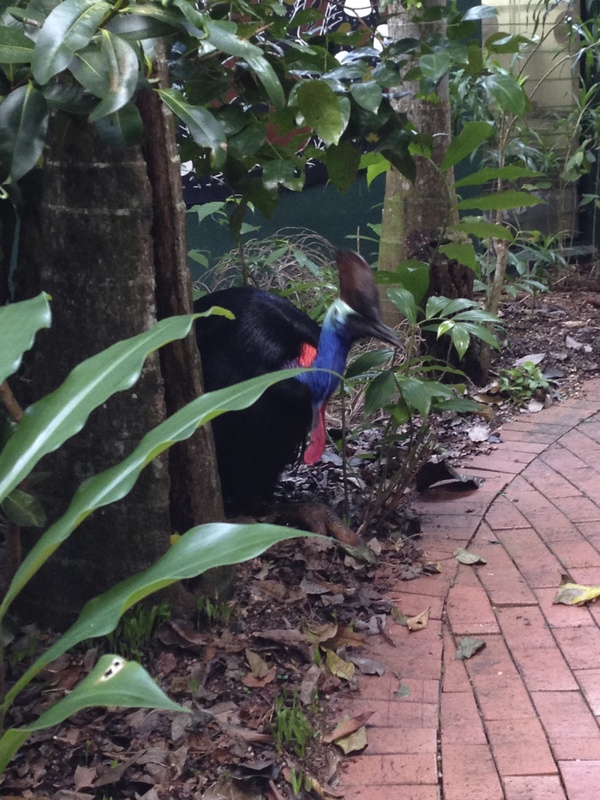 The bird was called the cassowary, it was huge and I’d never seen an animal like it. It looked slightly like an ostrich with brightly coloured feathers and huge sharp claws. Everyone was moving very slowly and whispering as they are apparently very dangerous and aggressive birds. Then it was back in the car for a little snack of rice cakes and water before we hit the road again. It was nearly 6pm and we started thinking about stopping somewhere for the night. I heard there was a free campsite near Ingham with toilets and running water so we decided to head there and set up shop for the night. The campsite was just a roadside campsite and was packed with caravans and campervans. We tried our hand at cooking spaghetti carbonara in our campervan ‘kitchen’ and then called it a night. HelpX is provided primarily as a cultural exchange for working holiday makers who would like the opportunity during their travels abroad, to stay with local people and gain practical experience. In the typical arrangement, the helper works an average of 4 hours per day and receives free accommodation and meals for their efforts. You could participate in the programme on farms, hostels, pubs and families all over Australia, and was a great way to save money on accommodation and get the ‘true Aussie experience’. I’d spent quite some time messaging a few families in Cairns on the website and eventually one family agreed to have us in exchange for some babysitting and housework for four hours a day. We were picked up by Joanne (the mum) in Cairns city and she drove us to her house in the suburbs of Cairns. Joanne was in her 50s and a single mum from Darwin with three children: Patrick (10), Annie (13) and Georgie (17). When we arrived at their 40s style house, Georgie had already made a tuna pasta bake and a vegetable pasta bake for dinner. The family had so many different food likes and dislikes. Joanne, for example, was a vegetarian and had been all her life, Georgie only ate chicken, canned tuna and beef mince (only in bolognese), and Patrick only liked peanut butter sandwiches… As Joanne was a vegetarian and didn’t like to touch meat, the children cooked 90% of the family’s meals. The children had strict house rules and were each expected to cook a couple of times a week, clean the house, wash and iron their own clothes and walk the dog. The children had lots of questions about what our lives and schools were like back home – they particularly enjoyed hearing about the Oratory’s ridiculous rules. As their mum only bought healthy food and no junk, they would us ask what certain sweets that they’d seen on TV were like. They’d never tried peanut butter and jam sandwiches either! We woke up pretty early the next day as Joanne said she wanted us to have breakfast with the children every morning before they went to school. We ate a very early breakfast with Patrick at 7.15am and then dropped him to school before getting on with our ‘chores’ for the day. Once we’d done everything she’d asked we went into town to figure out whether we should settle in Cairns for a couple of months or go down South. 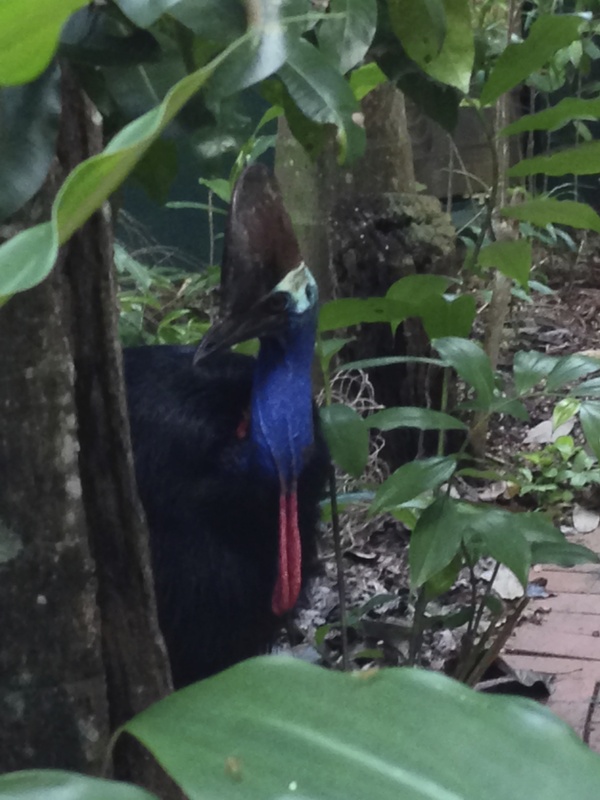 We walked around the city and quickly came to the conclusion that Cairns wasn’t too exciting and started considering our next move – Darwin or Brisbane? The next morning Joanne asked us to help her fit the new washing machine she’d just bought as part of our ‘chores’. Kyle helped her carry it in from the car and then we were responsible for taking out the old one and connecting the new one. We’d obviously never done anything like this before but it wasn’t too hard! As Joanne is a single mother and doesn’t get the chance to go out that much, she went out that evening with some friends to a ukele performance and we ‘babysat’ the kids again. It wasn’t exactly ‘babysitting’ but more making sure that they don’t kill each other. They were well behaved most of the time but occasionally the two sisters would have screaming matches. On Saturday we were assigned our biggest task yet: painting the house! I was pretty glad she did because I didn’t feel like we were doing our 4 hours of work a day, and painting the front of the house definitely made up for it. We had to sand down the panels that were to be painted, wipe them down with bleach to prevent mould, cover the edges with masking tape to protect the house against paint splodges, and then paint the panels blue! It took us about 6 hours all in all and Joanne was really pleased with the results. They’d only bought this house a year and half ago when they moved from Darwin and the house was very much stuck in the 40s. I actually really enjoyed the painting (possible career move?). Joanne wanted to go away for the weekend and meet her boyfriend in Townsville, so we were in charge for the kids for the next couple of days. We cooked a delicious roast chicken for them all on the Saturday night and then watched a film together. Joanne said Georgie might try and sneak out to see her boyfriend, but she didn’t (well at least I don’t think she did….). It was also on Saturday that made the decision to head south for Brisbane and started planning our trip. 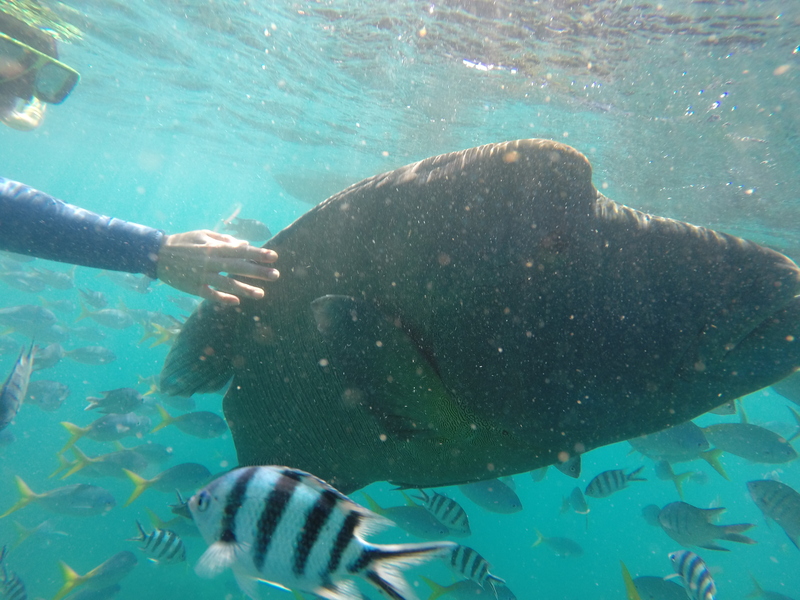 Cairns is great if you want to visit the Great Barrier Reef or Daintree Rainforest, but you can’t visit these places everyday because it costs too much money. 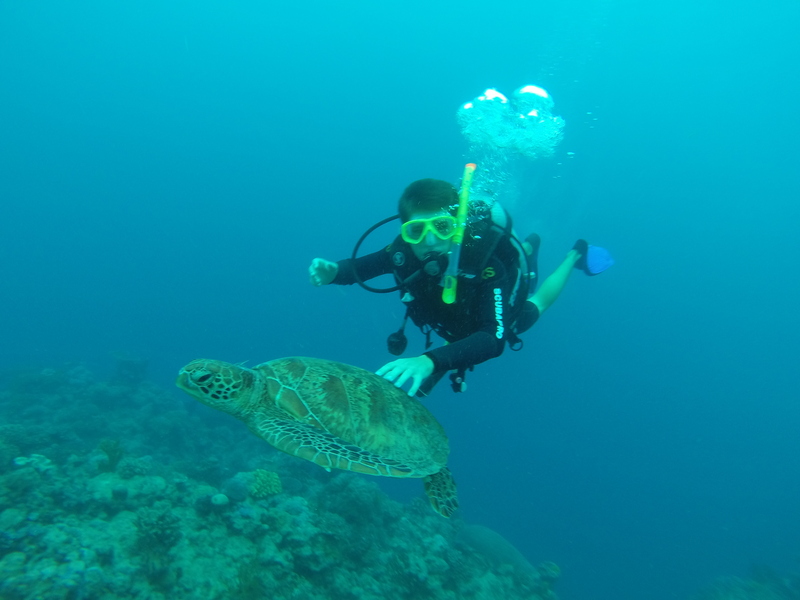 For example, a dive on the Great Barrier Reef will set you back about 100 pounds, whereas in Asia we were paying about 15 quid or so a dive. 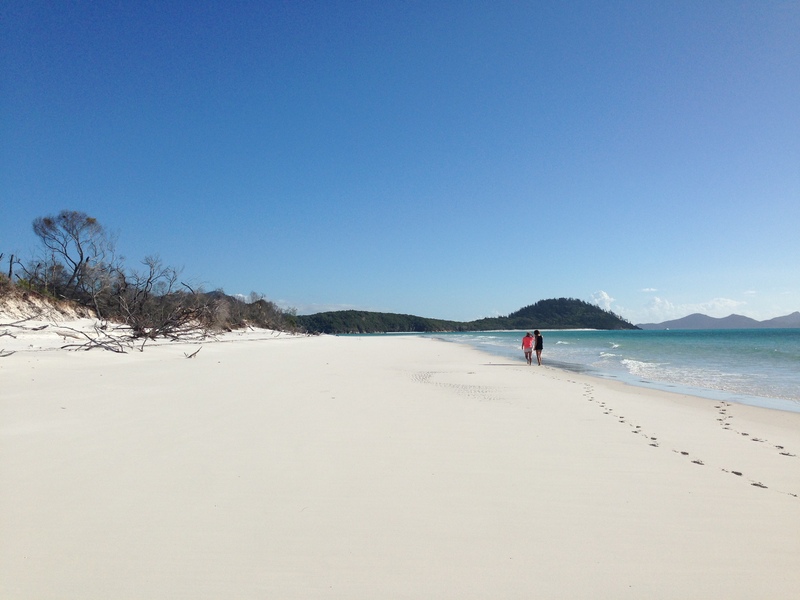 Now that we’d decided to leave Cairns we were trying to decide how to get to Brisbane. I really want to buy a campervan and drive down the coast, but Kyle thought we should just rent one and see what it’s like first. The Greyhound coach is also another alternative but works about the same price as renting a van once you factor in petrol… Decisions, decisions, decisions!!! After an extra four days in the Balinese sun because of a cancelled flight, we were pretty excited to start our Australian adventure. Jetstar obviously wasn’t too thrilled with that prospect, because five hours before our rescheduled flight was due to leave, we learnt our flight had been cancelled yet again! Jetstar told us they could put us on the next flight to Cairns in 2 days time, or they could route us through Melbourne. As Jetstar weren’t willing to pay to put us for the next 2 nights, we decided to fly to Cairns via Melbourne. We boarded the flight in Bali in the 26 degree heat and touched down in a VERY cold, grey Melbourne. 😦 Having spent a LOT of my undergraduate life watching ‘Nothing to Declare’, I was well prepared for the customs debacle at Melbourne International Airport. I feel cheated; no one swabbed my bags for drugs, no one confiscated any weird food, no one took my walking boots to quarantine, and no questioned me about my ‘plans’ for Australia. It was pretty disappointing actually. Just four hours in Melbourne gave us a taste of just how expensive Australia was going to be. Gone are our cheap delicious meals at Warung Makun, and hello 4 pounds for a tiny croissant! I was in the mood for a magazine to kill time before our next flight and that was even $12 aussie dollars! We were feeling pretty anxious at just how much money Australia was going to cost us. 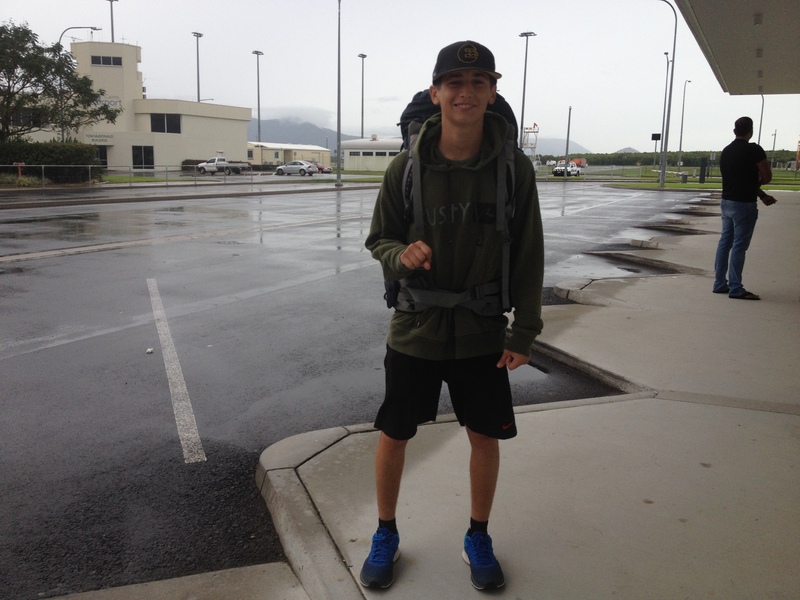 Lol Kyle waiting for the shuttle in Cairns! When we finally arrived in Cairns we expected to find clear skies and sunshine, but it was cold and raining (I thought the Balinese weather would follow us for some reason!). We’d arranged an airport transfer to the hostel and waited 45 minutes for it to turn up. When it finally did arrive we were greeted by this crazy Australian driver who shouted at me for not being there earlier. He couldn’t quite understand that the flight had been a little late AND we’d been waiting for him for 45 minutes. There were a group of guys on our bus and the driver couldn’t drop them in front of their hotel because of the Ironman Race, so one of the guys said to him, ‘no worries, we’ll try and find it with our GPS’. The bus driver lost it and said, ‘You don’t need a friggin’ GPS to get there, it’s right next to the cafe’… Welcome to Australia. When we arrived at Tropic Days hostel it suddenly hit us that we’d have to start getting serious and look for a work. We decided to hold off on our job search until the following day and went into town to see what the city of Cairns had to offer. 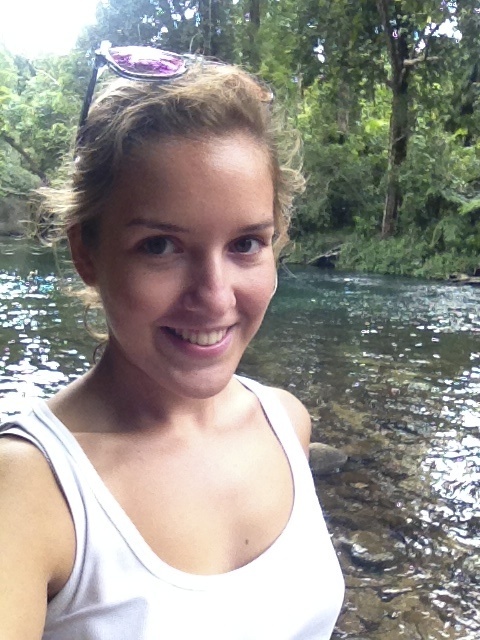 On first impressions Cairns was…. awful. It looked like a suburban American town with outdated shops signs and tourist tat (HAHA). Needless to say everything was pretty pricey! We bought some supplies and headed back to the hostel where we collapsed on our beds to sleep after the grueling 15-hour journey from Bali to Cairns, a trip that should have taken 5 hours max. 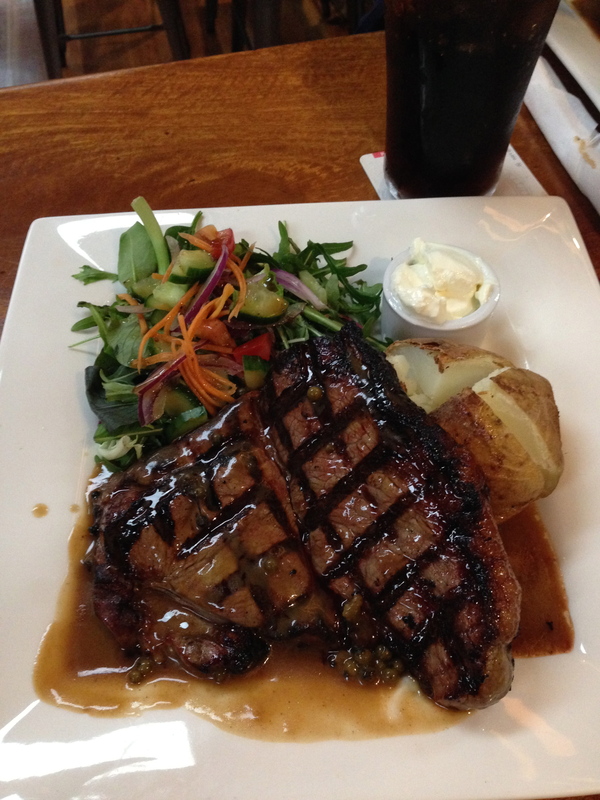 Had to have a yummy steak before that though! The following day we decided to head back into the city to see what it was like during the day time. It had a huge ‘lagoon’ (essentially an outdoor public pool), a shopping centre, an art gallery, and an esplanade with lots of shops and restaurants. There were so many restaurants that finding work looked promising. We returned to the hostel for its famous ‘All Australian BBQ’ to sample some crocodile, emu and kangaroo. There were about 70 backpackers at the hostel and it was a pretty amusing night to say the least. The BBQ was hosted by the hostel’s owner, Gabe, and he was full of hilarious stories and everyone sat on the edge of their seats listening to every word he said. He told us how his mother and father had been hippies or gypsies, and had travelled all around the world having children in different countries. We then all queued up and were given some croc, emu and kangaroo to try. Before we tried the croc everyone said the ‘tastes likes chicken’ thing, but I actually thought it tasted quite different to chicken. The crocodile was a lot denser and chewier than chicken, and had a slight fishy taste. We got chatting with the people on our table and everyone was pretty much in the same boat as us – working holiday visa. There were two Chinese students on our table and they were mesmerized with the concept of the working holiday visa, and couldn’t comprehend how our families could let us go away for a year and not get a proper job (haha!). He was really jealous that we could have the opportunity to travel around the world and visit all these amazing places. I told him that not all my family understood my decision, but hey! 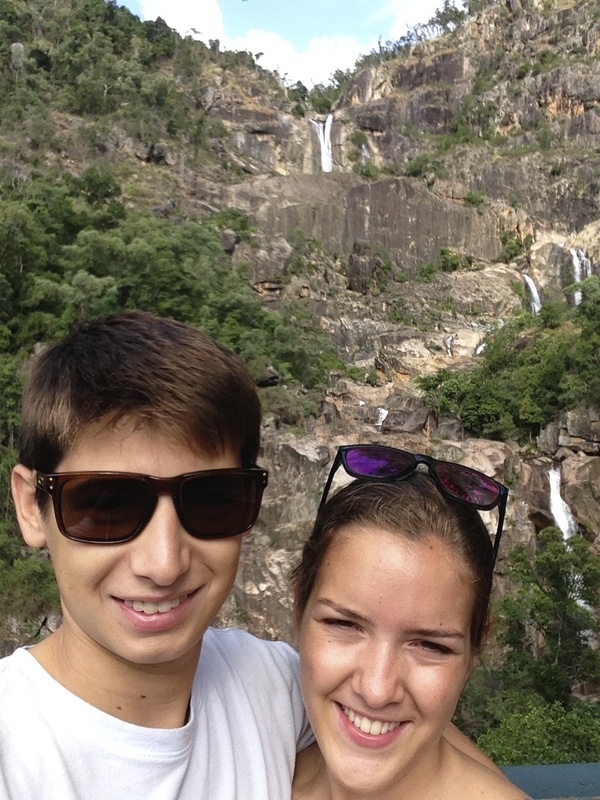 We met one girl who’d quit her job as a nurse 2 weeks before, rented her house and sold her car so that she could travel around the world with her boyfriend. She couldn’t bear to be without him for a year, so she decided to go with him! After enjoying our Australian feast, we were given another ‘Australian experience’ – a didgeridoo lesson. Gabe gave us a basic introduction into the didgeridoo and to be good at it you basically had to be able to blow a raspberry for as long as possible. After practising the motions for a while, Gabe asked three people to come forward and perform the didgeridoo in front of everyone. Three people came forward and they had to choose their choice of didgeridoo from a traditional didgeridoo, a white pipe… and a hoover. Gabe told us how he was very annoyed to find the hoover in the bin one day – didn’t she know it would make a fantastic didgeridoo?! The three didgeridoo volunteers were absolutely awful. We spent the next couple of days setting up bank accounts, applying for tax file numbers and printing our CVs. After 3 days at Tropic Days it was time to move to the suburbs to do the Help X programme with an Australian family that we’d found.